Jatiya Oikya Front key leader Dr Kamal Hossain on Friday reacted angrily when journalists wanted to know about his stance on Jamaat-e-Islami, which played an anti-liberation role in 1971. “Think of the martyrs. Think of the martyrs. Just keep your mouth shut. Shut up! What is your [the reporter who asked the question] name? I will keep you in mind. Where do you work?” he shouted to the journalist. Kamal Hossain, also president of Gano Forum, went to Mirpur in the capital on Friday morning to pay tribute to the martyred intellectuals of 1971 and faced a barrage of questions from the media. Some 22 candidates of Jamaat-e-Islami, a component of the BNP-led 20-party alliance, are contesting the general election with ‘sheaf of paddy’, the electoral symbol of BNP, as the Islamist party has lost its registration with the Election Commission as a political party. Components of the Oikya front are also contesting the poll with the same electoral symbol of the opposition coalition. “We are going to liberate the country from those who are working against the dream of liberation -- from lust and greed. People of the country will defeat them [the ruling Awami League], even if they are strong,” Kamal told reporters on the scene after paying tribute to the martyred intellectuals. As some reporters tried to draw his attention to Jamaat issue, he said he would not say anything about it at the martyred intellectuals’ memorial. When a reporter asked him about Jamaat’s participation in the election in association with the Oikya Front, Dr Kamal came down heavily on the particular reporter. “The question doesn’t arise at all. You’re arguing for useless talk. How much have you been paid to ask such questions? Who have paid you?” the Oikya Front leader questioned. Two of the leaders, standing beside him, tried to calm Dr Kamal while another journalist went on to ask more questions. 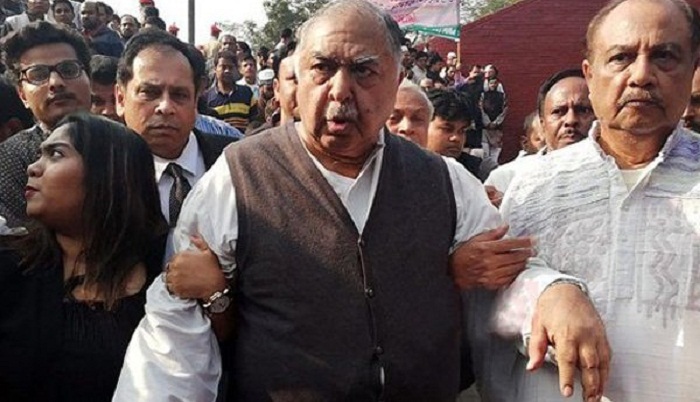 Political analysts said Dr Kamal, an aged person and a veteran politician, could not react in such a way he did as it is his responsibility to make his position clear about his relations with Jamaat. After his reaction, many people criticised him on social media.